Improve Your Luck - How to Be Luckier in Life! Are you lucky - or unlucky? How would you like to magnify your good luck? A 10-year scientific study into the "science of luck" has recently concluded, and revealed that luck is more than just coincidence. In fact, your luck can be consciously moulded and 'upgraded' - by you. Dr Richard Wiseman, the psychology professor behind the decade-long study, estimated that only 10% of "good luck" is actually down to chance. The remaining 90% remains something we actually control ourselves. The findings have exciting implications for almost anyone interested in improving their luck - and enjoying greater success, love, money and overall happiness. 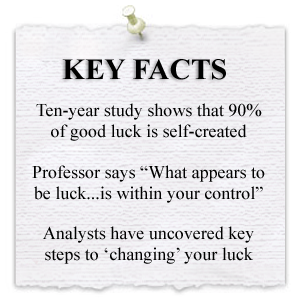 Learn more about the science of luck - and how you can manipulate your own good fortune - by clicking on the link below, and entering our website. Copyright WCCL 2019. Home | FAQ | Affiliates | Contact Us | Buy Now!